On the can, Amp proclaims that "Only AMP has MDX5TM." 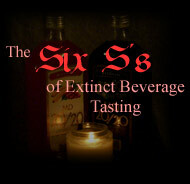 A little research on Amp's Website reveals why no other energy drinks have jumped on the MDX5TM bandwagon. It's quite simple actually. It's because Amp (with Pepsi's help) made it up. That's right. MDX5TM is nothing more than a collection of chemicals and herbs that Amp lumped together and trademarked so that no other drink could use it. Even if another energy drink contained this same collection of silly sounding ingredients, it wouldn't legally be able to claim that it has MDX5TM. Only a complete jerk would do something this childish. Whoever thought of this idea is a genius jerk. A visit to their website, if you can survive the Gen-X overdose, will answer many of the questions you may have about Amp. It will also tell you things that you could easily have figured out and other things that shake and worry you to the very core of your being. Amp's can and the beverage itself actually glow in the dark. Now I feel as though I have consumed anti-freeze. Q: Why did you make Amp? A: Basically we wanted to capture the same flavors of Mountain Dew that our consumers enjoy but we wanted to be able to make $2.00 a can as opposed to the $0.25 a can we were making from our Mountain Dew product. We feel that by adding Vitamine B-12 to it and putting it in a smaller, trendier can that we can accomplish this and you, the consumer, can get totally amped! It's a greenish yellow just like Mountain Dew. Or mucous. It smells like Moutain Dew that's been spiked with something else. Maybe it's herbal goodness? Maybe it's pure evil? Ever wish that Mountain Dew was more chalky and bitter? Ever wish it had a strange vegetable aftertaste? Ever wish that there was a faint taste of Nyquil as well? Guess what? Your wish is Amp's command. It's the same basic aftertaste as Mountain Dew but slightly cleaner. The lack of caffeine makes you wonder what else Mountain Dew has going for it. I didn't suffer as much as I thought I would from this beverage. It was certainly not worth the money but it wasn't wretched either. The thing that inevitably suffers the most is usually my wallet. Who are the dummies buying these things? Besides me. Even purchasing these once a month for reviews is practically putting me into the poor house. The only energy I got from this drink is disappointment which I have harnessed into an article. What do other people use that energy for? Assholes must convert this energy into road rage.